A very warm welcome to all visitors. Here you can find out about St James's Church and what to expect when you get here. What does St James's Church believe? The Church of England website says: "Christian life is lived in relationship with God through Jesus Christ, and in common with other Christians in the Church seeking to deepen that relationship and to follow the way that Jesus taught. Central to that relationship is knowing we can trust God. Saint Paul says at the end of the eighth chapter of his letter to the Church in Rome, 'if God is for us, who can be against us?' And this is the heart of faith." For Christians God is understood and known as Father, Son and Holy Spirit. Father… God is love, caring for creation and for every human being as God's beloved child. Son… God is as he has revealed himself to be in the historical person of Jesus Christ. Jesus' life, death and resurrection holds the key to knowing and loving God, and to making sense of life, before and after death. Holy Spirit… God is alive, loving and active today, inspiring faith, justice and truth, sustaining the life of the world, giving spiritual gifts to the church and bearing his spiritual fruit in the world - changed lives and a transformed society. St James's Church stands in this tradition. Who goes to St James's? 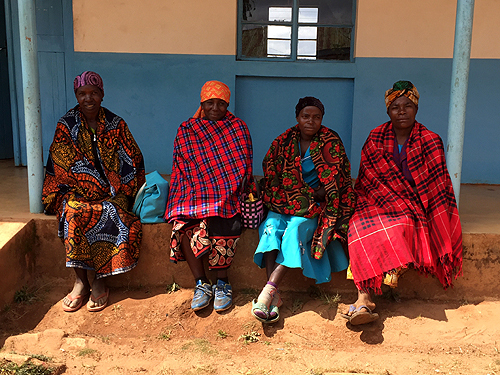 The congregation consists of a wide range of people from different backgrounds and of different colours and ages. Whoever you are you are assured of a very warm welcome at our church. In addition to when services are taking place, the parish office, in the west porch, is open Monday, Wednesday and Friday mornings and also Tuesday and Thursday afternoons. There is always somebody willing to chat to you, either by phone, e-mail or in person. See The office page for details. Where is St James's and how do I get there? The address is: St James's Church, 46 St James's Road, Hampton Hill, Middx. TW12 1DQ. Buses stop fairly near the church or, if you travel by train, there is a ten minute walk from Fulwell Station. If you are driving, there is plenty of free parking either in the car park adjacent to the church, or in adjacent roads. See the Location page for details. There are regular Sunday services and also other services, some of which take place regularly every week or every month and some just occasionally. See the Services page for details. All the services are entered into our calendar on the What's on page. What happens when I arrive at the church? When you first arrive, you'll be greeted by a member of the congregation, a Welcomer, who will give you a service booklet, hymn book and pew sheet (information sheet). Please ask them for help should you need it. Near the entrance you will find a table with information leaflets about the church, welcome cards, the Spire magazine, etc. Just help yourselves to this information. You can sit anywhere you wish. 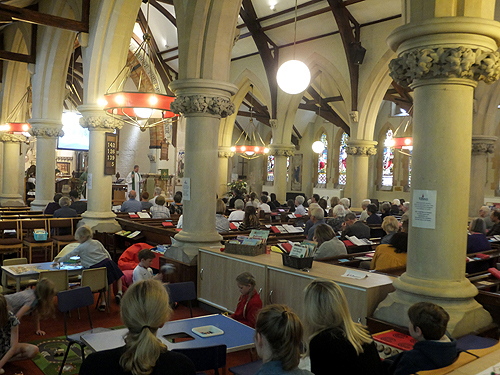 Have look at the following pages which describe the services held on Sundays: Parish Communion, Together at Eleven and the occasional All Age Service. What facilities are available for children during the service? There is a children's corner for both children and their parents which is well equipped with books and toys. The Shell Seekers Sunday School is a lively, caring group for children held in the church hall on Sunday mornings and would welcome your child. After Sunday Parish Communion services we invite everyone into the hall for parish breakfast. This is a very good way of meeting and getting to know people, especially for those new to the church. 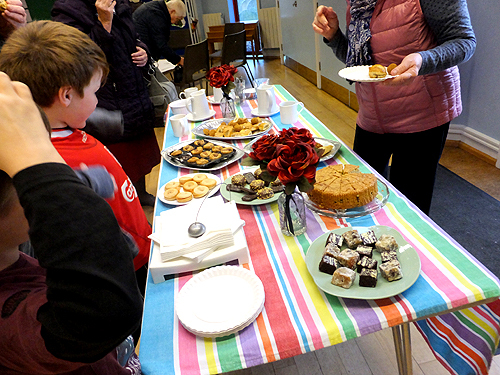 Every week between forty and eighty people, including many families with young children, gather in the church hall to chat and make new friends. Our small hospitality team provide tea and freshly-brewed coffee as well as cakes and hot bites. All our drinks are Fairtrade products. What help is there for those with disabilities? St James's is an all-inclusive church. Members of the congregation regularly bring to church and help those with limited mobility. The premises are accessible for those with disabilities. In the church there are large print service booklets, hymn books and notice sheets. The church also has a loop system for the hearing impaired. There are parking spaces near the entrance. There are accessible toilets both in the church hall and now also in the church itself. What activities can I get involved with? Within the church, we have opportunities for prayer and study in groups that meet either regularly or for a short series. There are various clubs and groups that also meet regularly or at intervals and you can find out about these on the pages, Groups and Social life. 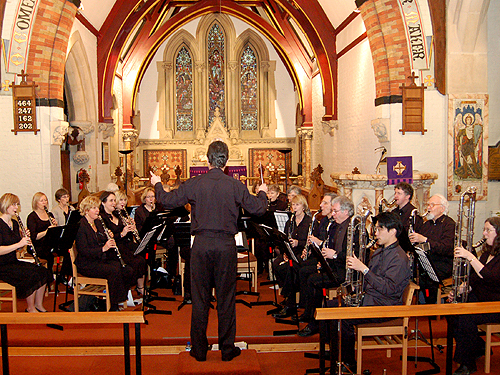 The choir and instrumental ensemble, St James's Players, always welcome new members. 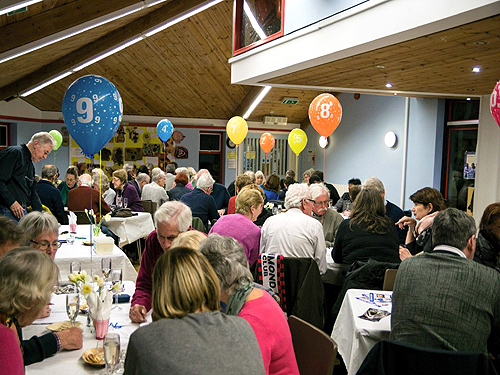 There are many helpers at St James’s who get on with the many tasks that produce a pleasant environment for worship, a smooth-running administration, and enjoyable social events. There are bellringers, cleaners, flower arrangers, people who prepare the parish breakfast, people who read the lessons or say the prayers, servers, sidespersons, people on the Parochial Church Council and teams for finance & planned giving, properties and social events. Why not see if any of them would suit you? What activities can my children get involved with? The Shell Seekers Sunday School is a lively, caring group for children held in the church hall on Sunday mornings. 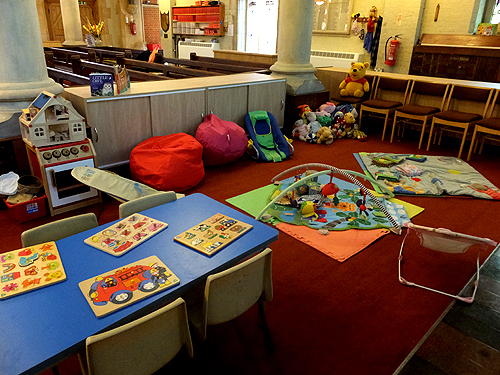 The popular St James's Ark Playgroup for all pram pushers (Mums, Dads, Grandparents, Carers) and under 5’s meet every Monday in term time from 10.15 to 12.15. The choir and St James's Players instrumental group also welcome children but please check with the leaders first. The Together at Eleven and the All Age Services have the needs of children and parents particularly in mind, though everyone is welcome. The uniformed groups often join us for the latter. Has the church links with charities and other organisations? Mission is the central objective of all our church activities. An important part of Christian witness is giving to others. We give to local, national and international charities. We also have links with other churches and organisations. See the Mission, witness and outreach and Community sections for information. How does the church interact with the community? 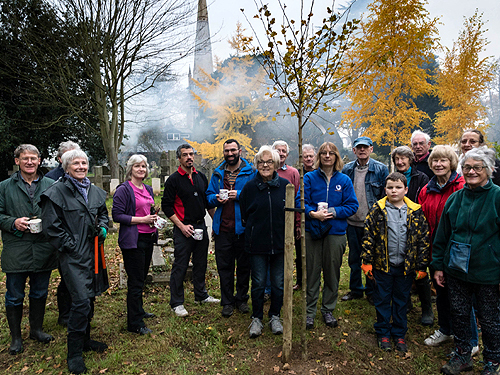 St James's plays an important role in the community of Hampton Hill in two different ways. One is by the clergy and members of the congregation going out into the community, ministering to parishioners, visiting the sick or housebound, going into the local schools, etc. The other is by opening the church and encouraging people to come into our midst. The church itself is a major focus in the local community. 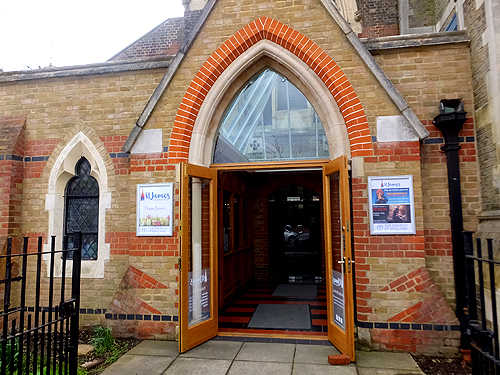 The layout of the church, its fine acoustics and the facilities of the adjacent hall all make St James's an excellent venue for a variety of events much used by local schools, community and musical organisations. 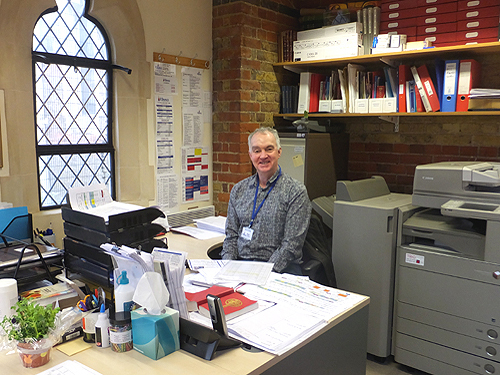 How does St James's keep in touch with its congregation and the community? 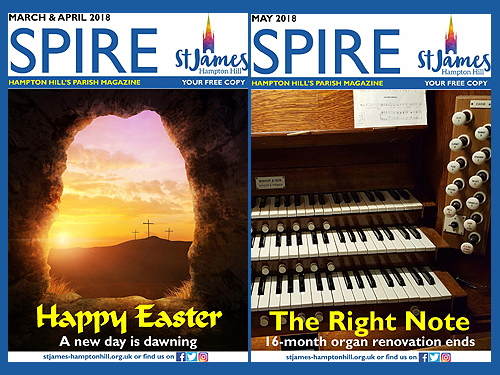 We keep in touch by publishing pew sheets once a week, the Spire magazine nine times a year and keeping our website up-to-date. In the church there is a table near the entrance with information leaflets about the church, welcome cards, the Spire magazine, etc. Every Saturday the vicar sends all congregation members a weekly email with greetings and any relevant information to keep everyone in touch with what is going on. 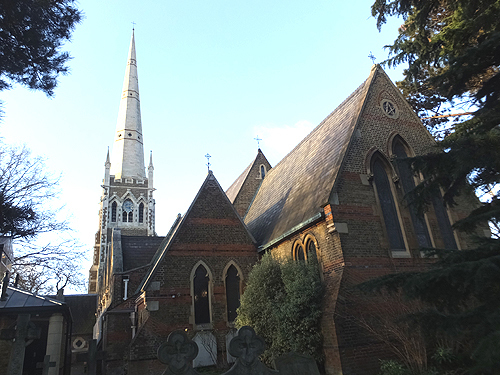 If you have any questions at all or want to know any details about St James's Church that are not on this website, please get in touch through the Parish Office on 020 8941 6003.